Will Davison is confident that he’ll be able to get through 250km at Phillip Island tomorrow despite ongoing pain from his Symmons Plains injury. 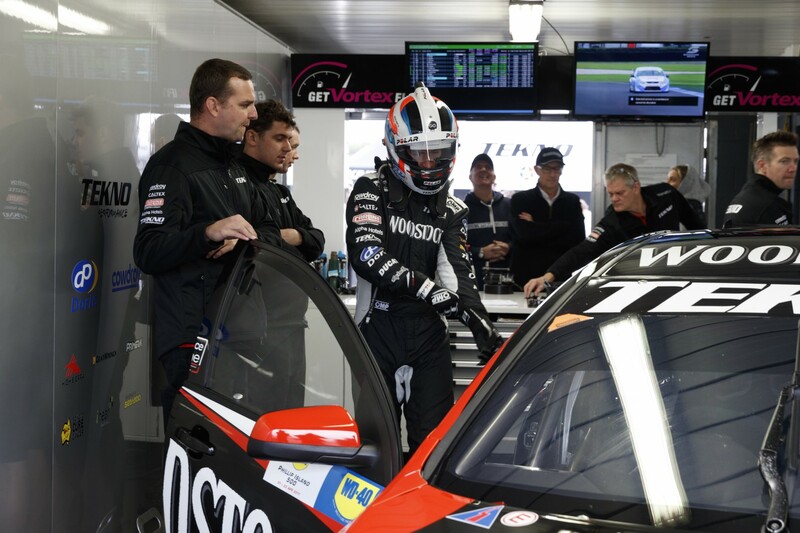 Still battling the effects of a fracture to an offshoot from a vertebra suffered at Symmons Plains a fortnight ago, Davison returned to the wheel of his rebuilt Tekno Holden today. The 34-year-old says a combination of padding, medication and work with a leading physio should be enough to see him through the weekend. “Nothing excruciating, it’s bearable,” he said when asked of the pain in the car around Phillip Island’s high-speed corners. “I wasn’t expecting it to be like in a lounge chair and not feeling a thing. I can certainly feel it a bit. “I played around with some different kidney belts, but it’s a fine line between tightness and support. I’m pretty comfortable that I’ll be alright for the long race. “I feel alright now. I’ve got my physio flying in tonight. It’s Jeremy Cross, who looks after Casey Stoner and travels to testing with him, as well as Adam Scott the golfer. “He’s a top physio. We’d been working together a little bit before this, but nothing serious. “I know him, he knows Jamie (Whincup) well and Riana (Crehan, Will’s fiancé) sees him a bit, but after this injury I’ve started seeing him. Davison added that he’ll likely take a pain killing injection before the 250km race. “I didn’t do any local anaesthetic today, but I might tomorrow,” he said. “I’m taking some pain killers and Doctor Carl (Le, Supercars medical delegate) asked me if I wanted more and I’d said I’d rather not. I’d rather try an anaesthetic tomorrow. Despite getting back in the car quickly, Davison says he’ll be carrying the injury for the next few weeks. “I’ve done a bit of research, and it’s a six, seven-week recovery,” he said. “It (my injury) is as good as it gets in terms of fracturing bones in your back, there shouldn’t be too many complications, but it’s not a two-week recovery. “It’ll be six or seven weeks before I’m running or doing anything like that. “I’ve looked at it and I’ve seen NBA players, I’ve seen footy players have competed a week later with local anaesthetic and medication.